Styled with a smart black leather strap and rich gold-plated stainless steel case, this charming timepiece is finished with a cute retro Mickey Mouse illustration on the gold tone arabic dial. 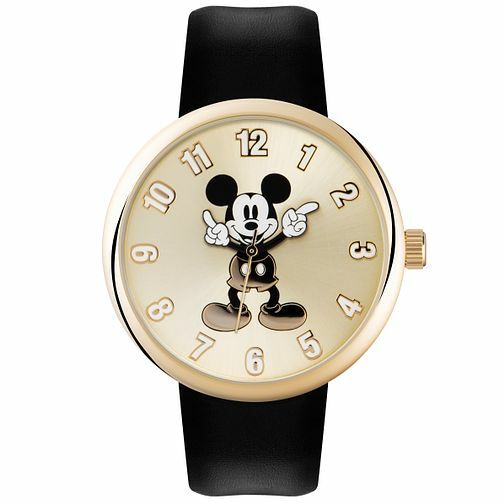 Disney Mickey Mouse Gold Dial Black Leather Strap Watch is rated 5.0 out of 5 by 1. Rated 5 out of 5 by Anonymous from Excellent gift Really pleased with this item. Lovely design and big watch face so easy to see the time. Mickey Mouse's arms being the hands of the clock was a nice touch. Overall, great gift for a more mature Disney fan and good price too.